Forget Kevin Garnett to Boston. The trade of the year was Harold Williams to Harlem. 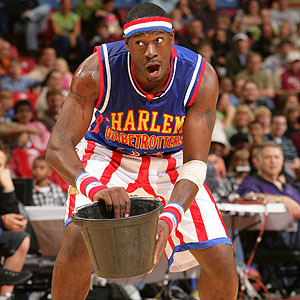 Harold Williams rose from the Washington Generals to new heights as a Harlem Globetrotter. It's not every day you pick up 15,000 games in the standings. But last fall a man hardly anyone's heard of went from the losingest team of all time to the winningest team of all time, in a deal straight out of Ripley's Believe It Or Not. It's a minor miracle somebody wanted him. His former team hasn't won a game since 1971, travels with only eight players, and doesn't sign autographs. Its most famous alum is 5-foot-7 and shrinking (he's 87 years old). And after timeouts the team never huddles up to say "1-2-3 win!" But somehow the kid got out. Somehow he got himself swapped to a team that's won 15,396 of its past 15,397 regular-season games. A team so elegant, its games are dubbed shows. A team so perfect, Las Vegas has taken it permanently off the board. A team so historic, it gave Wilt Chamberlain his start and Darryl Dawkins his finish. A team that has played in the rain forest and in Iraq. A team that has played on the bottom of swimming pools and on top of wooden desks. A team that must take credit for Hakeem Olajuwon, Dirk Nowitzki, Tony Parker, Pau Gasol and every other foreigner who's entered the NBA. A team more world famous than the Lakers and Celtics times three. That's right -- a nobody named Harold Williams got himself traded last season from the Washington Generals to the Harlem Globetrotters, by using the oldest trick in the book. Actually, begging makes the (basketball) world go 'round. After every NBA draft, hundreds of neglected players are out on the street, looking for work. Some end up in Europe, some in the Developmental League. And some, if they're like Harold Williams, end up sitting on their front stoops. Harold had once been a prodigious prep player in Jersey City, N.J., amassing 1,000 points and 985 rebounds for St. Aloysius High. On the local totem pole, circa 1999-2000, he was just a rung below top prospects Dajuan Wagner, Jason Williams (of Duke fame) and Samuel Dalembert. But his SAT scores were just a tad subpar, so he matriculated to Division III Montclair State. As a player he says he was "a coach's dream," meaning he distributed the ball and D'd up for the good of the team. He was a 6-foot-6 hustler who always saved his slick between-the-leg dribbles for the playground. To him it was a sin to be fancy. As a sixth-grader he'd seen a Scooby Doo cartoon featuring the Harlem Globetrotters, and after watching a Globetrotter throw a trick pass off his head, Harold actually tried it in a game. His coach blew a gasket. "Never again, Harold, or you're running 30 suicides!" So he turned into the chest-pass king. Life was getting more serious by the day, anyway. Harold's mom, Rita, had been diagnosed with ovarian cancer when he was 14. And while he was a sophomore at Montclair State, she was stricken with high blood pressure. He transferred to New Jersey City University to be closer to her, and ended up being named defensive player of the year for a team that went to the Division III Sweet 16. 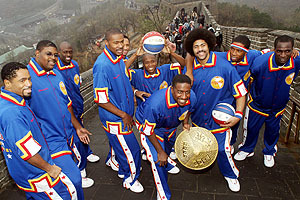 The Globetrotters have played all over the world, including a visit to the Great Wall of China. But the NBA wasn't paying attention. So after Harold went undrafted in 2004, there he sat on his front stoop. He'd dribble and spin the ball in the street, every which way, and his grandfather Thomas -- who'd had both legs amputated due to diabetes -- told him, "You oughta be a Globetrotter, son." Harold looked at him blankly. Since seeing that Scooby Doo cartoon 10 years before, he hadn't given the Globetrotters a second thought. In the 21st century the only "show" basketball that mattered was SlamBall or the And1 Mixtape Tour. But Thomas Williams, from his wheelchair, explained the Globetrotters' history, verse by verse. The Globetrotters were ambassadors of goodwill who, 62 years ago, introduced basketball to a clueless world with their first overseas trip. They went behind the Iron Curtain at the height of the Cold War, and once played a game under martial law in Bogota, Colombia, with machine guns pointed at their temples. They broke a backboard in Germany one day and had to play half-court ball. They broke another backboard in Belgium and duct-taped a coat hanger to a pole instead. They played in bullrings in Spain, on tennis courts in Bermuda, and on a ballroom dance floor in Germany that was so slippery they doused it with Coca-Cola to make it sticky. They lit up a court with car lights in South America, and tossed errant passes into the ocean in the Bahamas. Without the Globetrotters, basketball might never have gone so global, which is why they're partly responsible (like it or not) for every foreign man who's played in the NBA. But most of all Thomas Williams crowed about the famous Globetrotter showmen, particularly his hero, Meadowlark Lemon. Back in the 1970s Lemon was the clown prince of the sport, stuffing basketballs in opponents' jerseys and shooting about 50 percent from half court. He packed a trick ball that was attached to a rubber band, and also perfected the famous water bucket act, when he'd chase a teammate with a pail, drench him, grab another bucket and drench a fan with ... confetti. Meadowlark Lemon used to school the Washington Generals. Harold was riveted, and he promised his grandfather he'd go see the Globetrotters at the Meadowlands later that year. When he did go, Harold, who was still team-less, couldn't take his eyes off the current Globetrotters Showman, Paul "Showtime" Gaffney. For instance, when a female spectator stood up to leave her seat in the second quarter, Gaffney literally stopped the game. "Hey lady, where you going?" he howled. The woman turned around, mortified. "Oh, to the bathroom, that's right," he said. "I can tell by how you're walking." It went on like that all night. A very short player on the opposing team was about to shoot a free throw, when Gaffney got down on one knee to say, "Hey, boss. Da plane! Da plane!" When the player bricked his foul shot, Gaffney started laughing. And then he told the Globetrotters' bench to laugh, the first row of fans to laugh and the whole arena to laugh. Harold told his grandfather, "That's what I want to do." And he went back to his stoop to practice. It wasn't a sin anymore to be fancy. The chest-pass king was now spending every waking hour spinning a ball on his finger and then transferring it, still spinning, to the finger of his wife. He made passes with his elbow, his fist and his derriere. He rolled the ball down his arms and across his neck. He did it for a year, right up until his grandfather died. Devastated by the death, Harold gave up on his dream -- gave up trying to be a magician, gave up trying to be a Globetrotter. He signed with a team in England and returned to basketball dirty work. A year later he was back in the States, jobless, and in July of 2006 he went to the L.A. Summer Pro League to resume begging. He hoped to catch on with a team in the D-League. But in between games one night he began doing his ballhandling shtick on the side of the court, for levity. And someone happened to be standing there: a Globetrotters scout. The scout put Harold in touch with Trotter legend Tex Harrison, who invited Harold to a tryout in Illinois. But the day before the audition Harold's wife went into labor with their first child. He couldn't leave. He called Harrison, asking for a mulligan. He left five or six messages a day, for a week. Harrison, who'd been traveling, finally called back and asked Harold where he lived. "I've just moved to Dunn, N.C.," Harold said. "Well, the team's in Raleigh in March," Harrison said. "Can you get there?" That March, in 2007, Harold Williams broke out every basketball trick known to mankind. He almost tried drop-kicking a half-court shot, but at some point he had to give the ball back to the Globetrotters. They said they'd be in touch, and later that week Williams' phone rang. But the wrong team was calling: the Washington Generals. Beggars can't be choosers, or something like that. The Generals happen to be the team that plays (i.e., loses) to the Globetrotters every night, so they were naturally in the building that March day in North Carolina. They had noticed Harold's crisp chest passes, his fundamentally sound footwork and his accurate midrange jump shot, and the Generals -- always looking for bodies -- offered him a fair-to-middling contract. Harold decided if he couldn't join the Globetrotters, he'd try to beat them. The only problem was, it hadn't been done in almost 40 years. What he didn't realize was that the Generals, formed in 1952, are villains, excess baggage. They are booed whenever they take the lead, and their last victory -- on Jan. 5, 1971 -- caused an absolute maelstrom. Red Klotz (left), the owner of the Washington Generals, is a legend himself. The game took place in Martin, Tenn. Witnesses say Lemon lost track of the score and began yukking it up with the Globetrotters holding a fragile lead. While Lemon was heaving half-court hook shots and kicking the ball out of bounds, the Generals' player/coach/owner Red Klotz -- the shortest NBA player of all time outside of Muggsy Bogues and Spud Webb -- couldn't miss. With about 12 seconds left, the Globetrotters' lead was down to one point and, when Lemon blew a gimme, the 50-year-old Klotz buried a 30-footer at the buzzer to win the game. Kids cried. The public address announcer wanted time put back on the clock. Klotz was assailed, according to media reports, "for killing Santa Claus." The shot ended a 2,495-game Globetrotters winning streak, and Klotz says Lemon entered the Generals' locker room afterward -- as they were dousing each other with orange soda -- to say congratulations, you whupped us. "Well, you know what he told us?" says Lemon's sidekick, Curly Neal. "He said, 'I didn't lose, you all lost.'" Either way, the Globetrotters have been paying back the Generals, or whatever their name is, ever since. Klotz, who retired from the team at age 62 but still plays half-court pickup hoops at 87, has changed his team's name over the years to the New Jersey Reds, the New York Nationals, the Atlantic City Seagulls and the Boston Shamrocks. But their most recognizable name, the name still most associated with losing, is the Generals. Last NFL season, when the New England Patriots were trampling the Buffalo Bills on a Sunday night, commentator Al Michaels broke out the old cliche: "They're making the Bills look like the Washington Generals." So the name's obviously still part of the sports vernacular. And when Harold Williams joined the team in April of 2007, their losing streak was up to 12,490 games. 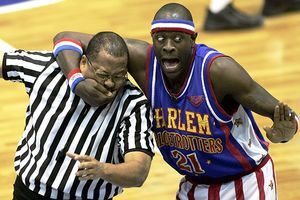 Kevin "Special K" Daley, a Globetrotter showman, has some fun with a referee. Of course, the minute Harold put on the Generals/Nationals/Seagulls uniform for a nine-week tour through Europe, he was fair game. And the first person to abuse him was "Showtime" Gaffney. Gaffney took one look at Harold and then bounced a pass between his legs. On the next possession he buzzed one over Harold's head. Next time, between his legs again. Next time, over his head again. "And the whole time I'm thinking, 'I'm gonna guess right soon and take it the other way,'" Harold says. That never happened. Instead Gaffney would tug on Harold's shorts, tell him he had BO, and blow kisses at him. He'd hand him a wig and a purse. But the low point was the night in Sicily when Harold bricked a free throw and Gaffney stared at him. Belly laughing. Gaffney then asked the Globetrotters' bench to belly laugh, and the crowd to belly laugh. Harold had seen this act three years before, at the Meadowlands, and began to panic. His next free throw was an air ball. Gaffney fell to the ground, howling into his microphone, and that was Harold's turning point. He decided if he couldn't beat them, he'd join them -- over the rim. Harold had always been adept at throwing alley-oop passes, and the next night he threw one from half court for a Generals dunk. Soon his alley-oop feeds were coming in waves, and they began to turn a few Globetrotters' heads. There was nothing wrong with that, because Klotz, to this day, claims the Generals do not lose on purpose -- that they try to score on every possession. And that's largely true. The problem is they don't always try to defend, and that's why Harold, in his debut stint as a General, ended up losing 60 games in 60 nights. Go to a Globetrotters game, and you're guaranteed to see some acrobatic dunks. But it wasn't a total loss. 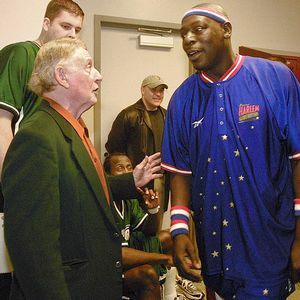 Every day after practice Harold would ask the Globetrotters' coach, Clyde Sinclair, for tips. He'd ask him how to run the famous Globetrotter weave and the team's other sacred plays. He told Sinclair he wanted to be a Showman -- like Lemon, like Gaffney -- and Sinclair let him in on a secret: He'd once been a General too. Sinclair told Harold he had made the Washington-to-Harlem switch himself back in 1988. And a floored Harold asked him what to do next. Sinclair, who by now had a soft spot for Harold, told him the Globetrotters' brass would be watching his every move, his every alley-oop. And he told him to call Tex Harrison. Good ol' Tex. "Oh, I already have his number," Harold said. Harold ended up phoning Harrison from Milan, and Barcelona, and everywhere in between. He phoned him before breakfast and after dinner, and after his 65th call Harrison dialed back and gave Harold his first nickname: Telephone. He also invited him to his hometown of Houston. He wanted to meet him. Harold showed up in Texas in the summer of 2007 with tricks literally up his sleeve. He had taken every Globetrotter nuance and spent the previous month perfecting it. He had watched old film of Lemon, and actually had high school kids in Dunn, N.C., practicing the Globetrotters' offense with him every day. When Harrison first laid eyes on Harold's act, he was pretty much sold. The only red flag was that Harold was left-handed, and every Globetrotters play is choreographed to go right. Harold lied to Harrison, telling him he was ambidextrous. And when Harrison huddled up with his personnel people, they all admitted they'd never seen a player so desperate to be a Globetrotter. In September Harrison called Harold and offered him a contract. He said Harold had officially been traded from the Generals to the Globetrotters -- for absolutely nothing. Harold told Harrison it was the steal of the century, and Harrison told Harold he had to pick a nickname -- that every Globetrotters player has to have a nickname. His choices were Telephone or Lefty. Harold chose Lefty. Behind the scenes the Globetrotters' brass was excited. Showmen are hard to come by, because not many players can double as stand-up comedians. And Harrison was hoping to groom Harold to be their third Showman, behind Gaffney (who toured the East Coast) and Kevin "Special K" Daley (who toured the West Coast). On the season's opening weekend in Sacramento, Calif., last November the Globetrotters sprung their game plan on Lefty. Under new Globetrotter CEO Kurt Schneider -- late of the WWE -- every game was going to tell a story. At the end of every first half, Gaffney or Daley would leave with an injury, and another Showman would replace him in the third quarter: Lefty. Then Gaffney or Daley would make a triumphant return in the fourth quarter, sweeping the crowd off its feet. Harold got the chance to perform the water bucket trick himself. It was a lot to put on a neophyte like Harold, but his debut at Arco Arena went almost flawlessly. With Gaffney watching from the bench, Harold flicked a bounce pass between a General's legs. He bounced an alley-oop off his head for a dunk, and barked like a dog whenever a General took a jumper. He went up for a blocked shot one time and his shoe flew off -- so he corralled the rebound, handed his shoe to the General who was guarding him, and raced, in his tube socks, for a layup. He performed the water bucket act. And, best of all, he won the game. His personal record was now 1-60. After the game was over he looked up at the rafters and said, "That was for you, Granddad." And when he kept hopping around the locker room, a teammate, "Hi-Lite" Bruton, said, "Calm down, big fella. You got 100 some-odd more of these." and Harold was the first to join him. "I actually fell down, I laughed so hard," Harold says. But soon Harold began to feel the weight of it all, began to feel the nightly pressure of the show. Gaffney's word for it was "the hole." Every night, the Showman was responsible for each trick, each no-look pass, each joke. Every eye was on him -- and every ear too, because he was miked up. And the third quarter was exponentially tougher because much of the crowd was either at the concession stands or still thinking about the injured Showman. It was up to the third-quarter Showman to thrill the arena immediately ... and Lefty began to fail. His problem, according to Harrison, was that he was more interested in winning over his teammates than winning over the fans. And that was understandable, considering these were the same teammates who were pummeling him six months before. Harrison told him to bow to the crowd or blow kisses, but when Harold tried that, it seemed rushed and forced. Beneath it all, he was still the chest-pass king. "We found out he's not a stand-up comic, to be quite honest," Harrison says. 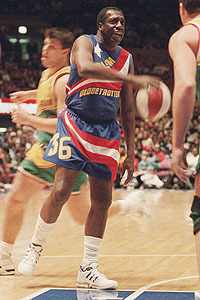 Harold began to be relegated to Globetrotter University, which is when certain lower-level players talk to the fans before the game about the team's history. Harold loved connecting with the kids, but he also found himself being replaced in third quarters by "Big Easy" Lofton, a 260-pound teddy bear with a guttural laugh. Lofton tended to stumble over his words, but by season's end he'd surpassed Harold. 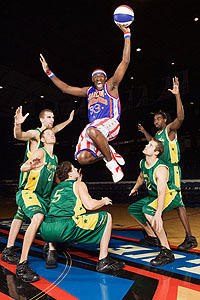 In April of 2008 the U.S. tour was ending, just as the NBA playoffs were revving up, and the Globetrotters' final stop was in Oklahoma City. Harold took a melancholy stroll around the arena that night, and took stock of his season. He'd played 106 games in 96 cities and eight countries. He'd played in Madison Square Garden and the Meadowlands -- in front of hi now-healthy mother -- and his won-loss record completely obliterated Garnett's Celtics: 106-0. When the final buzzer sounded he roamed the court, looking for fans to greet. A little girl tugged on his jersey, and because she couldn't afford any Globetrotters memorabilia he knelt down, unlaced his sneakers and handed them to her. Then Harold walked by himself to the locker room. In his tube socks. Four days later the Globetrotters cut him. The news was delivered over the telephone, which was fitting, and Harold was both stunned and hurt. Jobless again. "I think [Harold] wanted to be a Globetrotter more than he wanted to be a Showman," Harrison says. "See, as a Showman, you've got to have something that gets the crowd on your side. And we could never find it, and he couldn't seem to find it either." Lefty didn't last long as a showman, but it still was a dream come true. Harold ran through his options in his head. He was only 26, so he could probably return to Europe or audition for the D-League. But that meant going back to Long Beach for the Summer Pro League in July, along with all the undrafted neophytes. For more than a month he called no one, and mostly daydreamed about the Globetrotters. He beat himself up for not watching more film or thinking of more jokes, and it kept him up at night. He hung a framed Globetrotters jersey in his house, along with a photo of him and Curly Neal and a ball signed by all his teammates. "Some people might think I'm crazy," he says. "But to me, to be part of something like that -- it's larger than life." Rather than continue moping around, Harold began working with young players at the Dunn, N.C., Police Athletic League. 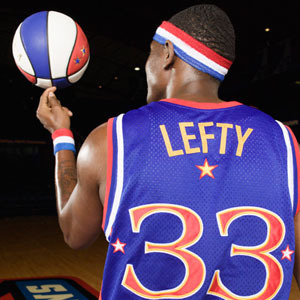 The kids all knew who he was -- Lefty, the Globetrotter. He was asked for autographs at gas stations, fast-food joints and Winn-Dixies. How could he tell these people it was all over? In May, the phone rang. And it was the right team calling: the Globetrotters. They wanted to know how he was. That they might need someone to work in their Advance Ambassador program. The job would be to go into cities a week before the team, visiting schools and hospitals, telling the same Globetrotters stories his grandfather told him. He wouldn't be playing ball or doing the water bucket schtick, but he'd be on the payroll. He told them he was interested, and they said they'd be back in touch in the fall. It sounded like his best bet. Because as time wore on, he knew of only one other team that was definitely looking for a player like him. A team with a fairly brutal schedule: the Washington Generals. "Oh no, no, no, no, no, no, no, no, no," says Harold "Lefty" Williams. They'd really have to beg.